On this page you will find records of all of the events that have been performed by the choir in 2014. The Choral Extravaganza was an event in support of the Warminster Festival of Music and Sound. 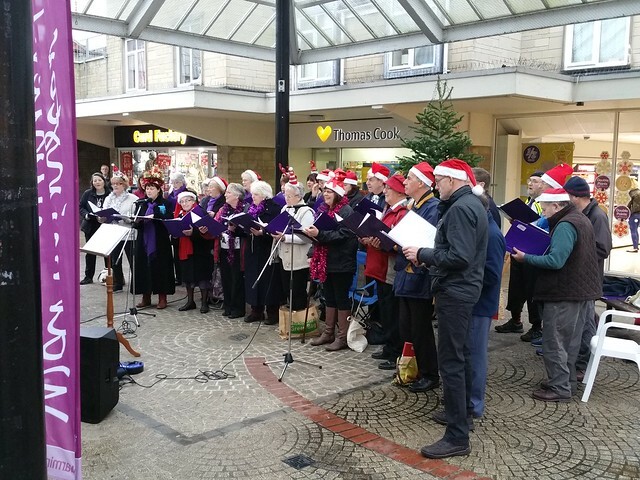 The Choral Extraveganza was organised by the Warminster Community Choir and featured ACTS Theatre Arts School, Sutton Veny CP School and the Warminster Military Wives. A total of £747 was raised towards the Touching Tones Music Therapy Trust from this event. Feedback: Wow! What great singing on Saturday night - well done. The guests were buzzing on the way out. The choir were joined by the Warminster Brass Band for a summer busk in the Warminster Three horseshoes Mall on 18th July. This was the final concert for the choir this term and the theme was uplifting and fun. The format was that the choir sang for approx 20 minutes, followed by the Brass band for 20 mins, then there was 2 songs together, then the choir closed in the final 20 mins. A total of £170 was raised for Alzheimers Support from this joint event. Once again, the choir were asked to play at the Warminster Carnival Committee's fun day in the park on Sunday 6th September 2015. 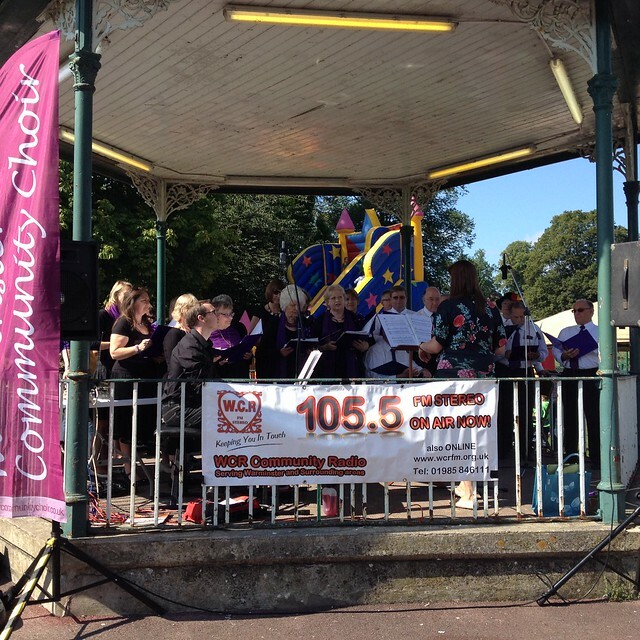 The weather was beautiful and this year we were on the bandstand along with Warminster Community Radio who provided public address for the choir. The Choir and the Military Wives performed at the celebration of 150 Years of St. Johns Church, Warminster. The songs were interspersed with short stories and anecdotes from the past 150 years of the Church. Military Wives performed first with 6 songs; this was followed by the interval, during which nibbles and drinks were served and the Reverend Brett tried very hard to sell 2016 Church calendars!. Our Choir sang in the second half with 8 songs. Both choirs then joined for the final 3 songs. The choir enjoyed the concert and feedback was all positive. The choir had been invited to this very special event to support the congregation at the Christening of the future Lord Bath. The choir were invited to join others in the celebration concert of the Minster Christmas Tree festival. We were playing with both Minster and Sutton Veny primary School choirs, Fourplay, Kingdown Voices and the Military Wives choir. This was our main Christmas Concert. All moneys raised went towards Alzheimers Support (£487) and Action for Alexander (£183). We all had a great time and hope our audience did to. A small concert of Christmas pieces played to the residents of Henford House, Warminster. Our final concert of the year. Time to let the hair down, no stress and just enjoy singing carols for an hour in the local mall. We had competition though, at one end was the Lions Santa float, at the other end was the Salvation Army band. But a great time was had by all our members in this final fling of the year. There was even an impromptu singalong to one of the bands songs.